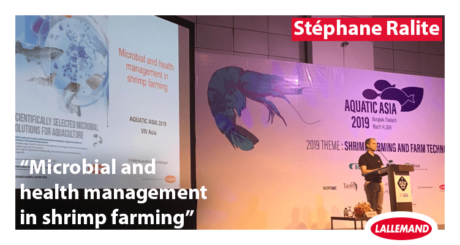 Earlier this month, Stéphane Ralite talked at the Aquatic Asia 2019 Conference in Bangkok about “Microbial and health management in shrimp farming”. By taking a microbiologist’s approach to shrimp health, he highlighted the importance of both gut and water microbial ecosystems on shrimp health and performance. This fresh approach to shrimp farm management was well received by an audience of around 100 aquaculture specialists. Based on practical examples, Ralite demonstrated the link between these microbial ecosystems equilibrium and shrimp health. He then discussed the possibility of contributing to secure this equilibrium by managing gut and/or water microbiota, as part of good shrimp farming practices. Microorganisms play a crucial role in the success of shrimp farming, in the gut, but also in the water and pond soil. We start to have a good picture of the microbial composition of these three compartments, even though we are at the beginning of the story and much research still needs to be done in this area. Concerning the gut, the link between shrimp health and gut microbiota is reciprocal. If it is clear that the digestive microbiota plays a crucial role in shrimp health, it also appears that shrimp health, in particular the immune status of the shrimp, influences the composition of the digestive microbiota. The shrimp’s ability to maintain a stable microbiota goes hand in hand with its resistance against pathogenic or environmental challenges. The application of new metagenomics techniques enables to show that it is possible to orientate shrimps gut microbiota with probiotics in order to help enhance their resistance against pathogens or sanitary challenges. The efficacy of probiotic bacteria Pediococcus acidilactici MA18/5M (BACTOCELL), the only probiotic authorized in the European Union for use in shrimp and fish, to help prevent the proliferation of vibrio in vivo was presented. The mode of action of this probiotic in shrimp is well described. It has been shown for example to be effective in reducing oxidative stress. 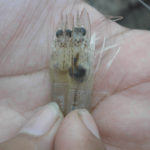 In consequence, shrimps are able to overcome important stresses such as pathogen pressure, temperature changes or pond transfer. In addition, trials have shown that this probiotic, associated with an innovative multi-strain yeast fractions product, is effective to reduce the impact of white feces disease for example. Finally, the pond water and soil ecosystems are equally important to maintain shrimp health and ensure optimal growth. It was shown with metagenomic data that, adding selected bioremediation bacteria in the water, enables to improve the water microbial ecosystem, resulting in enhanced nitrogen cycling and ammonia control in the pond. This has a positive influence on the composition of the water, a prerequisite for optimal performance. In conclusion, shrimp microbial management should be a multifactorial approach, involving shrimp nutrition and management, as well as water and pond microbial management. Shaping the future of aquaculture in South of France!